Last week saw the launch of Eddy Webb’s detailed and brutally honest review of the Sherlock Holmes stories ‘Watson Is Not An Idiot’. Critics have called it a brilliant introduction to the original stories. An early review says: “I am in love with this book. As a Sherlock fan, I didn’t think I would be able to learn more about Doyle’s work. Boy, was I mistaken.Eddy brings you to Doyle’s world and explains the common misconceptions of certain key phrases, Sherlock, and of course, Watson (who is not an idiot).” This week’s new title is very special. 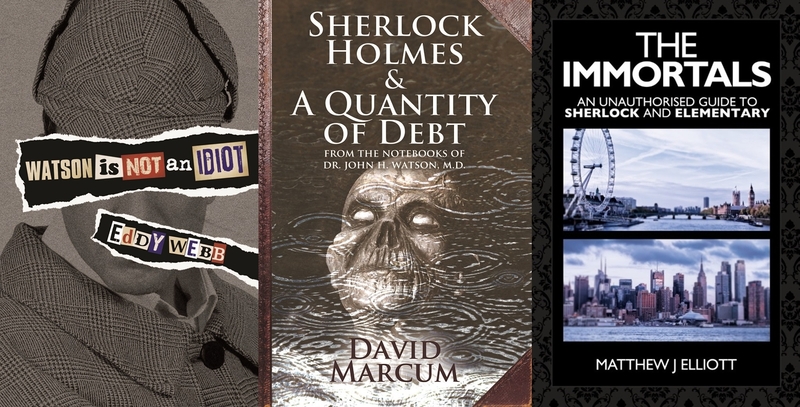 ‘Sherlock Holmes and a Quantity of Debt’ is a special edition hardback of David Marcum’s debut Holmes novel. We say special as David’s two short story collections (The Papers of Sherlock Holmes 1 and 2) have been bestsellers since their launch in June and September this year, and compiled together into a stunning 13 hour audio version. Reviews have been amazing: “David Marcum has achieved the ultimate Sherlock Holmes pastiche, David is indeed the undisputed master of the modern Sherlock Holmes story, to read these stories it is as if Conan Doyle himself has written them.No doubt about it David Marcum is THE best Sherlockian author of today.If like me a purist and like Sherlock Holmes stories as Conan Doyle intended them this then this book is an absolute must.” The reaction to the short stories gave us the confidence to include in the launch a special hardback. Finally, this week sees a fantastic free event for Sherlock Holmes fans on Friday 8thNovember, 7pm at the Park Plaza Sherlock Holmes Hotel. The launch of ‘The Immortals’ a comprehensive review of the BBC Sherlock and CBS Elementary series from Holmes expert Matthew Elliott – free tickets available from http://theimmortals-efbevent.eventbrite.co.uk/. Watson Is Not An Idiot is available from all good bookstores including Amazon USA,Amazon UK, Waterstones UK, and for free shipping worldwide Book Depository . In ebook format it is in Amazon Kindle, Kobo, Nook and Apple iBooks (iPad/iPhone). Sherlock Holmes and A Quantity of Debt is available from all good bookstores including Amazon USA, Amazon UK, Waterstones UK, and for free shipping worldwide Book Depository. In ebook format it is in Amazon Kindle, Kobo and Apple iBooks (iPad/iPhone). The Immortals: An Unauthorized guide to Sherlock and Elementary is available from all good bookstores including Amazon USA, Amazon UK, Waterstones UK, and for free shipping worldwide Book Depository . In ebook format it is in Amazon Kindle.